We just launched The Ministry of Stained Glass with Jackie King For Individuals and For Groups. In the early twelfth century, a German monk who used the name Theophilus (though it may have been a pseudonym) wrote a treatise called On Diverse Arts in which he discusses in useful detail the methods by which medieval artists made stained glass windows. The steps that he describes include the creation of the glass itself, which was done by melting potash (a combination of sand and wood ash) and adding powders to the molten glass to color it. The artist created a pattern that was traced onto the glass and the pieces were cut and in some cases painted. The pieces were wrapped in lead strips, fitted together, and soldered into place. A cement (made of unknown ingredients, though historians speculate the chalk and linseed oil were involved) was applied to the lead, and the window was installed. 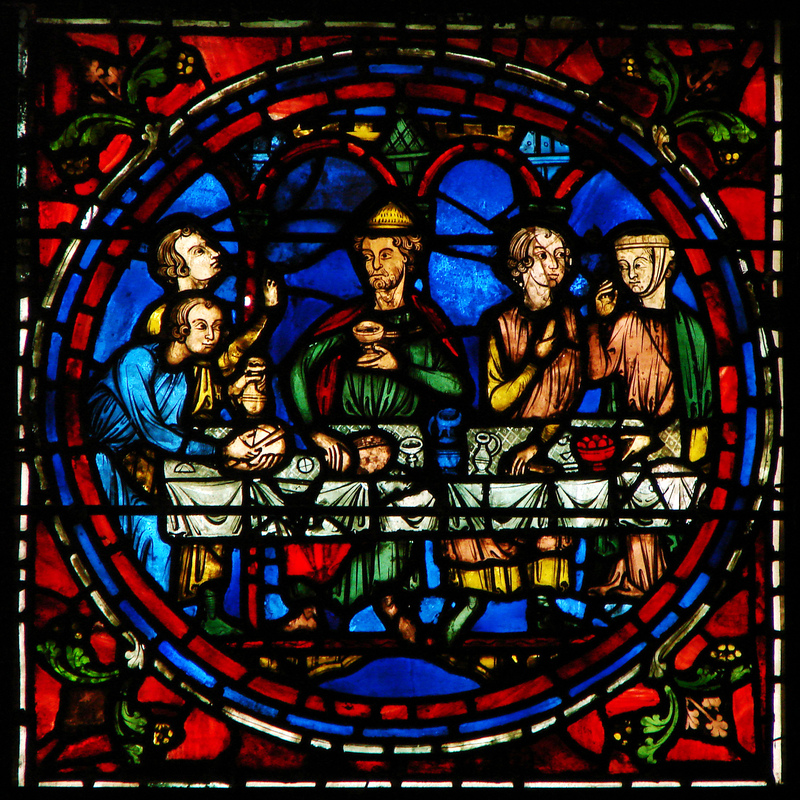 In this course Jackie King, who leads tours and discussions about stained glass at Washington National Cathedral, explains modern methods of creating stained glass windows. If you compare them to the ways that people made them for Medieval churches, you will find that the stained glass craftsmen of the Middle Ages and the men and women who create windows for churches today utilize many of the same basic techniques. The window patterns have changed in style over the ages, but similar methods and challenges unite the stained glass artists of today with their predecessors of many centuries ago. They take basic elements from the created world, apply fire and strength and craftsmanship, and use these elements to celebrate the glory of God and of God’s creation. In this course, Jackie discusses the purpose of using stained glass in churches, the symbolic power of stained glass windows, and the styles of stained glass window that have been important through the ages. She discusses methods by which artists create and install windows in churches. She also offers insight on some of the windows in the Washington National Cathedral and the best approaches that visitors in churches can take to appreciating stained glass windows. For a preview of the course, please click here. Image 1: Detail from Notre-Dame de la Belle-Verrière, a thirteenth-century window at Chartres cathedral in France. This part of the window depicts the Marriage at Cana. Public Domain. Image 2: Notre-Dame de la Belle-Verrière, a thirteenth-century window at Chartres cathedral in France. Public Domain. With these ideas in mind, here are three MORE ways to keep your church ministries aware of what resources are available to them through your church’s subscription to ChurchNext. Communicate with other ministry leaders. As you begin your work, take a few minutes from time to time and let various ministry leaders know that we have courses that support their ministries. For example, find out who is training lectors at the moment and suggest that they use Reading and Praying in the Church: the Office of the Lector in their lector training. People who can’t make the training can even take the course at home. We offer courses that support many ministries in the church, from Lay Eucharistic Ministry and the Altar Guild to refugee advocates and tutors. We have a series of courses that vestries use on retreat and to train new members. We even have a course that one church uses to great effect with its grounds committee. Many churches have found that these courses are very helpful in supporting their parish ministries — but not the ones whose leaders don’t know the courses exist. Enter you, dauntless ChurchNext administrator! Communicate through transitions. The world exists in a state of change. Despite the Christian devotion to an eternal and unchanging God, that truth seems somehow truer in churches. If your parish priest leaves, the person running ChurchNext should wait until the next one is settled and then meet with the new priest and tell them about how the church has been using this resource. Likewise, if you, elite ChurchNext Administrator, wish to remove your cape and superhero tights and return to civilian life, make sure to pass that cape along to another intrepid soul and tell that soul that it’s important to be proactive. Thus will your ChurchNext subscription endure and remain useful from one generation unto another. Keep the parish aware of ChurchNext opportunities. Communicating about these courses should be informal as well as formal. Sometimes friends or small groups within parishes find it useful from time to time to study an issue that interests them outside of a formal ministry. For example, say that you have friends at church who are exasperated at their attempts to communicate with people who disagree with them politically. (This scenario is likely at present if your church exists anywhere near the U.S. or any of its territories.) Get together over beer or tea or noshes and take Bridging the Political Divide with Parker Palmer, or take it at home but around the same dates so you can build on each other’s comments. Likewise, people often take informal courses over Lent and Advent, or maybe over the summer. You can also communicate about courses by making announcements in the parish newsletter, posting on the parish social media platforms, and/or in church announcements if something interesting is going on. If a Big Class is coming out that you think people might like or if a course has been launched that seems particularly relevant to the life of your parish, let people know so they can take the courses if they want to. We hope that these suggestions help you work with your parishes. Our whole purpose in creating these courses is to help enrich the Church through the technology that is available to us today. You are a big part of helping us fulfill that ministry, since you are the people who bring the courses into the lives of your parishes. So, many thanks, and please keep up the good work! We just launched Introducing the Washington National Cathedral with Randy Hollerith For Individuals and For Groups. The Washington National Cathedral holds unique roles both in the United States and in The Episcopal Church. Commissioned by Congress in 1893, the Cathedral was intended as a place devoted to “religion, education, and charity” — a potentially confusing mission statement for a government-founded institution in a country that separates church and state. Today, the roles of the National Cathedral remain complex. It is no longer funded in any way by the federal government, but it still holds a traditional Inaugural Prayer Service after a President has been sworn into office, as well as holding many state memorial services and funerals and events commemorating national days of celebration and mourning. It is an Episcopal cathedral and the seat of the Presiding Bishop of the Episcopal Church, but its mission statement begins with its promise of “serving as a house of prayer for all people and a spiritual home for the nation.” This vision for the church means that it takes an extremely ecumenical and inclusive approach, reaching out to the nation with interfaith services, concerts and other events designed to move people into spiritual contemplation. One goal important to the cathedral is to reach out across religious divides to try to accommodate people of many faiths. In this course, The Right Rev. Randy Hollerith, Dean of the Washington National Cathedral, explains the multiple roles that the church plays in our church and in our culture. He discusses the history and physical features of the Cathedral and describes his vision for the Cathedral as it continues to grow and change over time. “The great thing about a cathedral is that it is never finished,” Dean Hollerith says. “It’s always being created. It’s always being added to. …This is a place that is always changing and adapting.” This course is designed to give you insight into the changes that have taken place in the past and the new steps that the Cathedral’s leaders hope to take as the Washington National Cathedral advances further into the 21st century. Image 1: Photograph of the Washington National Cathedral. Carrol M. Highsmith. Date Unknown. Public Domain. Image 2: Photograph of the Interior of the Washington National Cathedral. Mina Elias. 23 August 2010. Creative Commons. Image 3: Photograph of “Ex Nihilo” sculpture over central door of the Cathedral’s west facade. Tim Nelson. 29 December 2011. Creative Commons. So you — a wise clergy member, a bright seminarian, a dedicated lay volunteer, a dauntless Christian Ed director, or a terrific example of whatever else you happen to be at your church — have made the commitment to be your parish’s ChurchNext administrator. You’ve gotten the subscription. You’re ready to explore that course list. You’re rarin’ to go. You meet with the clergy. They are excited! You use a course in adult formation. It’s awesome! You’re off! That initial burst of enthusiasm is a great springboard into using ChurchNext courses, but you, intrepid ChurchNext administrator, will need to keep pushing along to keep the courses useful in your parish’s activities, especially over the first year. The various branches of your church will probably want your input on how to make use of this resource since they won’t know as much about it as you do. Remember that they don’t all know what courses are available. They may not know that the church even has access to this resource. In many cases, you will need to suggest ways to use ChurchNext as part of your parish’s life. We particularly recommend that ChurchNext administrators who are lay volunteers rather than staff members emphasize a proactive approach to letting people know what courses exist. Volunteers don’t have the opportunity that regular staff meetings offer to offer suggestions as to how ChurchNext courses might be relevant to your church’s ministries, so don’t be shy. Tell people! They can’t use the courses if they don’t know they have access to them. Keep up with ChurchNext course offerings. It will help you to know what resources might help with what ministries if you glance over our recent course offerings from time to time. We write a blog post every time we launch a new class, so you can scroll through the blog and read about recent course offerings, and we also post about them on Facebook and Twitter. You can also keep up with other relevant ChurchNext options, such as our certification programs and our curricula in this way. Meet with the Clergy. Set up meetings with the rector, or perhaps with anotherclergy member who works with adult Christian formation, as often as seems reasonable. Try annual or biannual meetings to begin with. Consider scheduling these meetings for July or August and right after Christmas since those are times when churches often plan fall and spring programming. Talk to the clergy about the parish’s goals for the coming months and projects that are in the works, and consider ways in which ChurchNext courses might be useful in supporting those goals and ministries. Find courses that support current church goals. Let’s say that in your meeting with the clergy, you discover that the church really wants to emphasize reaching out and welcoming the local community to your church over the coming year. You remember from perusing the course list that we have some classes about those topics. You might suggest to the clergy that a session or two of adult formation cover Stephanie Spellers’ Radical Welcoming course. Or you might get in touch with the welcoming committee and suggest that they use Welcoming Visitors with Elizabeth Geitz as part of training people in this ministry. Be creative and proactive! There are all kinds of ways to help support the church’s goals with ChurchNext courses.